We mentioned the 'Rowdy Rooftop Burner Fund' back in May and the first two ebay auctions have now gone live!! UK Graffiti artist Rowdy walked out of his house back in May, which also served as his studio and when he returned a half hour later, everything had been burned to the ground. These auctions have come about to raise funds and to get him back on his feet. 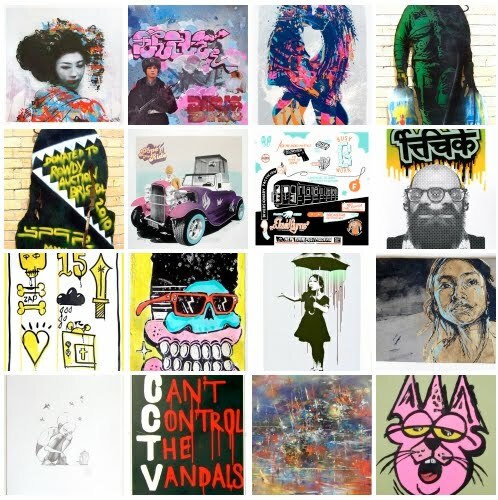 All the Art in the auctions have been personally donated by the artists and the galleries that represent them: Banksy, Paul Insect, Swoon, Sickboy, Hush, Espo, the whole Burning Candy crew and a whole bunch more... So, it’s your chance to buy something beautiful and help a worthy cause. Steal From Work are organizing the ebay auctions and have split the donated work into six different auctions, all of which can be viewed on their Steal From Work website. The site also lists the dates and work featured in each auctions. If you want to check the first two auctions then head straight to their ebay page here and get bidding!